Wednesday, May 2, 12:30–7:00 p.m.
On May 2 the School of Visual Arts Design Criticism MFA program, a.k.a. D-Crit, presents its third annual thesis conference, and this year’s line-up promises to be intriguing, covering an array of subjects–“Main Street, USA and the Power of Myth,” “Graphic Ornament in Interior Architecture,” “Towers to Town Homes: Public Housing, Policy, and Design in the US” to “Missing the Modern Gun: Object Ethics in Collections of Design,” to name a few. The list of thesis topics alone makes a statement about the possibilities of design criticism and how D-Crit aims to push its limits. To encompass this eclectic collection of research and ideas, the students invoked that ultimate master of the mash-up, Charles Eames, who once said “Eventually everything connects—people, ideas, objects…” Connecting the dots at this afternoon conference will be Julie Lasky of Change Observer, who will emcee and preside over four themed panels—Calculated Nostalgia; Working/Not Working; Speaking Surfaces; Man, Machine, and Morality—each featuring several high-profile keynotes, including media historian Stuart Ewen, Pentagram partner Michael Bierut, 2×4 founding partner Michael Rock, cultural historian Jeffrey Schnapp, and Interboro Partners principal Daniel D’Oca. Student presentations are grouped within the panels, and, lest you need further convincing, just have a look at the slick video teasers of the ten MFA candidates’ upcoming talks. 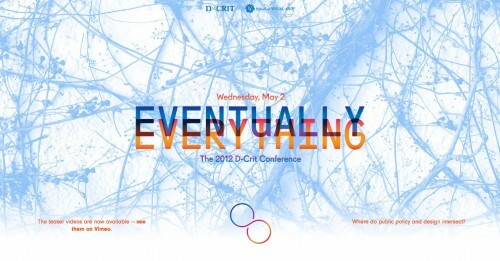 For more information, visit the Eventually Everything website or view the full program here. To attend, sign up for free registration, and follow @dcritconference for updates. January 31, 2018 A new exhibition asks: Are we living in digitally-rendered cities?